The Handsworth options will be discussed at the Tuesday January 19th, 2016 Board Meeting, 7:00pm, 5th floor, Education Services Centre, 2121 Lonsdale Avenue. This is an opportunity to gain an understanding of the process, cost and provide input to the Board in either of the two Public Comment periods. The seismic upgrade project is an approved project, while the full replacement of Handsworth would be an option for consideration by the Board of Education. Parents are able to share their views by writing to the Board Members and the Minister of Education. Our Hot Lunch program is run entirely by parent volunteers and cannot run without parent support. If you are available on a Tuesday or Thursday from 10:45am to 1:00pm, please volunteer through montroyal.hotlunches.net. Your kids will love seeing you around the school! You can still register for lunchtime Art Mania program Grades K - 7, on now until March 8th. See more details on our Programs & Events page. 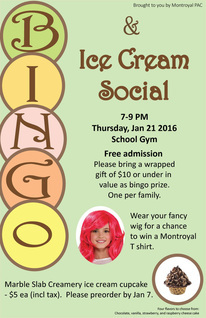 Put your fancy wigs on for Bingo & Ice Cream Social! We are expecting 200+ students, parents, teachers, and staff. Bring your lucky pens, pencils, or highlighters to mark your bingo sheets and save some room for those decadent ice cream cupcakes you've ordered. Please bring a wrapped gift ($10 suggested value, one per family) as bingo prize, and mark "M/F" on the packaging if it's gender specific. Grade 7’s will be selling drinks and Rico n’ Lalo frozen fruit bars. Babysitting with First Aid Hero emphasizes learning through real life scenarios. Information covered includes: Exploring the business of babysitting, creating safe environments, safely caring for ages 0-12, and first aid skills.